As our second-largest location, Suppose U Drive’s Ontario lot sits on 2 full acres. Although stake beds are the most popular rental option here at Suppose U Drive, you’ll be able to look over our broad and diverse inventory that includes panel vans, refrigeration trucks, transit vehicles and more models, all of which come in varying sizes to meet your needs. Featuring 5 shop bays, our Ontario on-location service center is capable of quickly handling the needs of all of our lease/rental vehicles in addition to taking care of maintenance work for our clients’ fleets. Like every one of our locations, you’ll benefit from the full washing services and fuel tanks that allow us to get your vehicle out the door and back on the road as soon as possible. 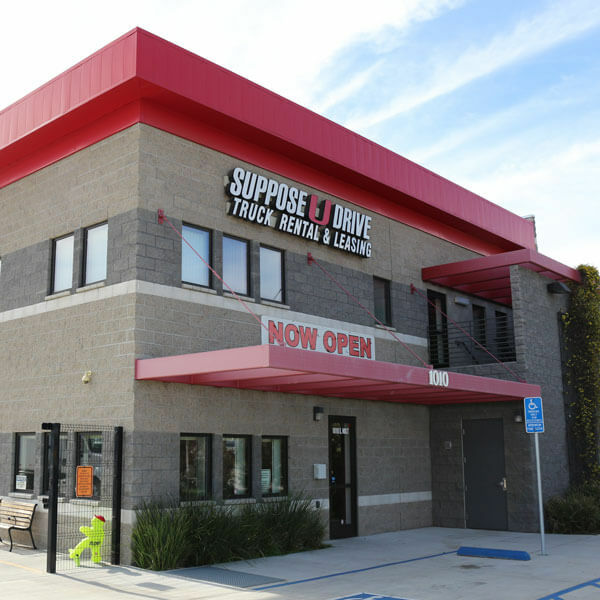 Our Ontario location can be easily accessed off the 10, 15, and 60 freeways. It’s located just west of the Ontario Airport. The staff at our Ontario location are extensively trained, just like all of the Suppose U Drive staff. This means they will make customer satisfaction and safety a top priority while using no-pressure, informative discussion to help you figure out which vehicle is best suited for your business. Stop by our Ontario location today and experience our high standards and quality service for yourself. Suppose U Drive rents by the day, week, or month, and leases for the long-haul. Our rental fleet includes box trucks, stake bodies, vans, studio trucks, and tractor-trailer combinations of all weight classes. Trucks are fully maintained and can be picked up and dropped off at multiple locations. Is The ELD Law is Getting Rolled Back?